This beautiful beaded bracelet from the Thomas Sabo Love Bridge collection is bright and stylish with a mix of colourful semi-precious beads. 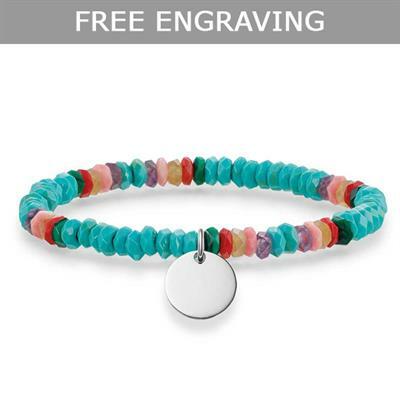 This colourful design has a flexible fit for an easy addition to your summer stack. This Love Bridge bracelet includes a 925 sterling silver disc charm that can be engraved. Let us know what you'd like to have engraved in the comments box at checkout. This style can fit up to 3 characters. Stones include turquoise, pink bamboo coral, red bamboo coral, malachite, agate and amethyst.